I'm currently hanging out under some blankets and trying to get warm and here I am with a frozen hot chocolate recipe! Yesss frozen things. I love cold drinks so much more than I love hot drinks which is why this is has happened. I'd rather drink a frozen drink and freeze for the next hour than drink a warm drink and be nice and toasty. I was telling my sister about this recipe the other day and she asked me why I was making something cold because we live in a cold climate. I told her that I was thinking about all of you warm climate people (as well as myself being there with you). It's true. If it's 70 degrees then you're more likely to want a nice refreshing drink that a regular hot chocolate, right?! 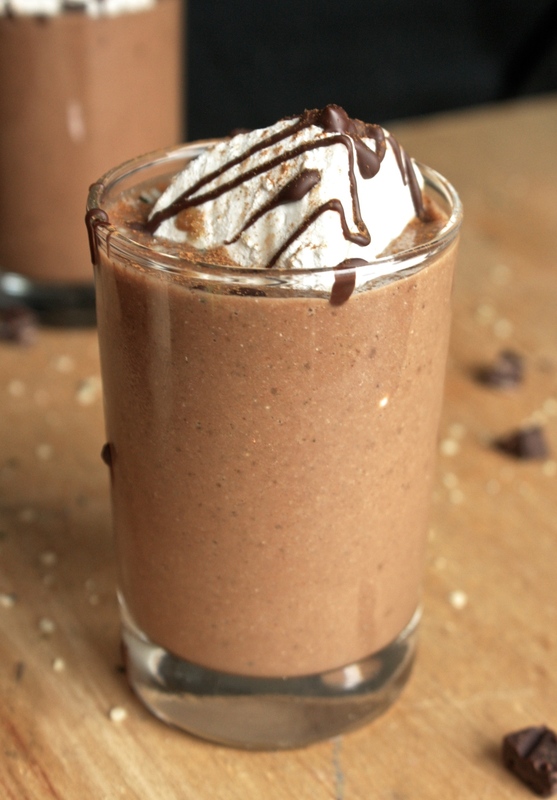 This frozen hot chocolate is so quick and easy to make. You can blend this up in about 5 minutes and drink it straight from the blender if you desire. That's what I do. It's a good time and it saves on dishes! The best. I'm always wanting quick and effortless treats and this is the perfect drink to make for both of those things! Blend together all ingredients in your blender. Serve, enjoy!